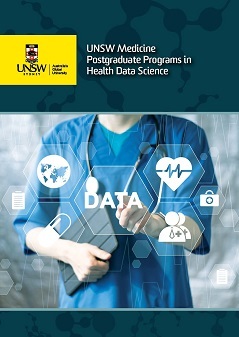 Covering the entire pipeline (from comprehension of complex health issues, through data wrangling and management, machine learning and data mining, statistical modelling, and communication including data visualisation), the Master of Science, Graduate Diploma and Graduate Certificate in Health Data Science are Australasia’s first postgraduate programs in Health Data Science. As part of the Centre for Big Data Research in Health at UNSW, you’ll belong to a vibrant community of researchers, educators, and PhD students. The Centre for Big Data Research in Health aims to maximise the productive use of all possible sources of health big data to enhance the health and well-being of Australians and the global community. Its interdisciplinary team of staff have world-leading expertise in managing, manipulating, analysing and visualising health big data. The Master of Science in Health Data Science 9372 (72 Units of Credit) is a fully articulated program with options for a Graduate Certificate 7372 (24 Units of Credit) and Graduate Diploma 5372 (48 Units of Credit). 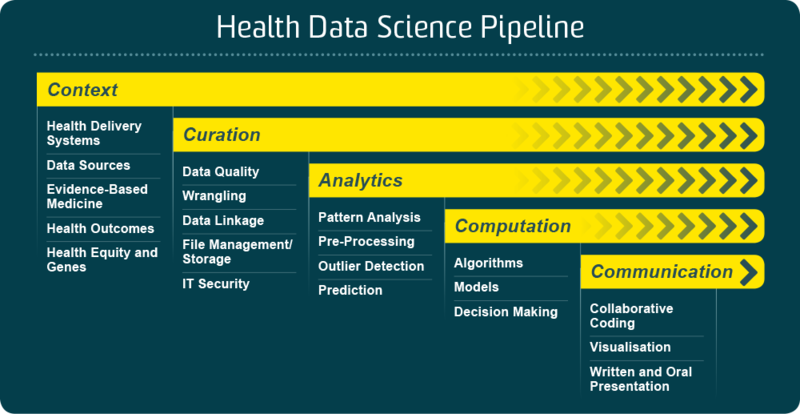 Students progress through the Health Data Science pipeline as they work through the degree levels. In the Graduate Certificate, students acquire foundational skills through 4 core courses in health context, programming, statistics and data curation and management. Skills in advanced statistical modelling, machine learning and data visualisation are then developed in the Graduate Diploma. The Master of Science provides an opportunity to experience the entire Health Data Science pipeline using a real-world health data problem through a workplace or internship research dissertation, or students can select a capstone project and further their technical learning with a choice of electives. High achieving graduates of the Master of Science can apply for a PhD program. The Health Data Science programs are designed for those new to Health Data Science and those already working in the field looking to upskill. Potential Australian and International students from any undergraduate background and/or who possess relevant work experience will be considered for admission via the Graduate Certificate pathway. Entry requirements are described in the UNSW Handbook for each program. Visit: Level 1, Centre for Big Data Research in Health, AGSM Building, UNSW, Kensington, Sydney.